Mubarak To Face Trial In Protesters' Deaths : The Two-Way The charges against Hosni Mubarak could carry the death penalty. The prosecutor also plans to bring charges against the former Egyptian president's two sons for allegedly accepting bribes and abuse of power. 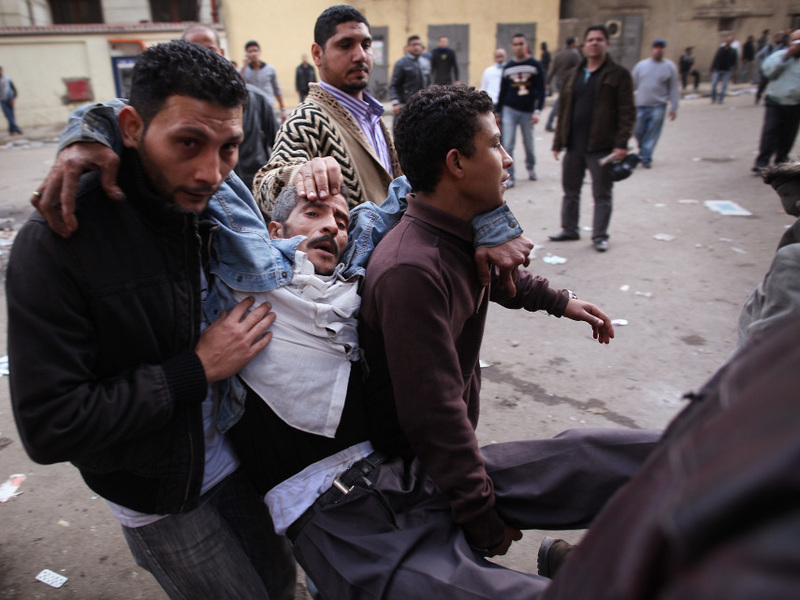 Jan. 29, 2011: Protestors carry an injured man away from Tahrir Square in Cairo, where police had cracked down on demonstrators. "Egypt's ex-President Hosni Mubarak will stand trial on charges of conspiring in the deadly shootings of protesters during the uprising that ousted him," The Associated Press reports. The wire service adds that the prosecutor-general's decision is "a major step in a country still rattled by protests and demands for justice." And, "prosecutor general spokesman Adel el-Said told The Associated Press the charges against Mubarak for his alleged role in the killing of protesters by security forces could carry the death penalty." In addition, as al-Jazeera writes, "the prosecutor also referred Mubarak's two sons, Ala'a and Gamal, and a close confidant, Hussien Salam, to stand trial in a criminal court as well" for alleged corruption. "Salam, a businessman, has been blamed for a controversial deal to supply Israel with gas at lower than usual prices. He has fled the country." Mubarak, 83, stepped down on Feb. 11 after a popular uprising that lasted 18 days. During the protests, "at least 846 protesters were killed, according to a government fact-finding mission," the AP says.